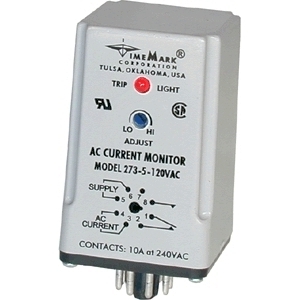 The Model 173 AC Current Monitor is a single set-point AC current monitor. 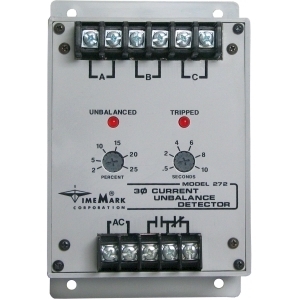 It can be used to detect either over current or under current, depending on whether the set-point is set above or below the input current. 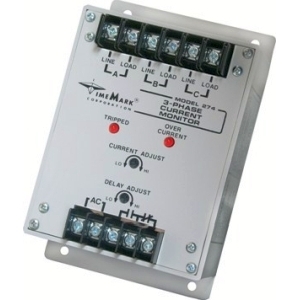 An LED indicator illuminates whenever the current is above the set-point. Two versions, either of which can be connected to 120 or 240 VAC, are available. One for current ranges up to 5 amps, the other for applications from 5 to 25 amps. 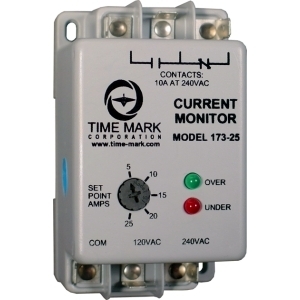 For currents above 25 amps, matching CTs are available. 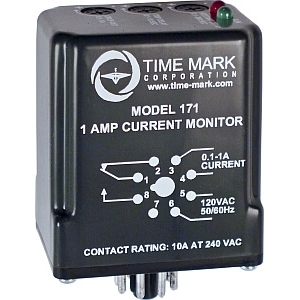 The Model 173 is not frequency sensitive and can be used on AC currents from 40 to 400 Hz. The compact housing is surface mounted with 1/4 in. quick connect terminals provided for input and output connections.